Looking to go to college, but you can’t make a decision? Choosing the right college is a big choice. Do you go by location? Price? Degrees? What if you could experience a day in the life of a college before making that all important decision? That’s the goal of Preview Day. Preview Day at CCBS is designed with you in mind. Join us for dinner at 6:00 pm (usually Chick-Fil-A). 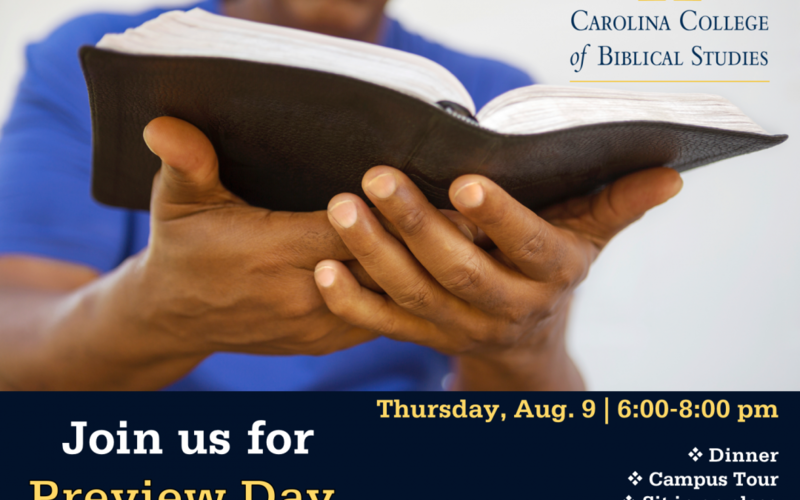 Then our Admissions Team and staff will explain some of the things that make attending CCBS great. We’ll explain our degrees, student life, financial aid, and even how to apply. You’ll have time to ask questions and even get a brief campus tour. But the real fun comes in the second half of the event. At 7:00 pm, you’re invited to sit in on a class. Sit in the back (or up-front), listen, interact…most importantly observe who CCBS is from the inside out. Then, if you’re ready to move ahead…we’ll help you every step of the way. If you’re not sure, then check out our tuition-free How to Study the Bible course. If nothing else, you’ll learn a valuable skill as a Christ follower. To attend Preview Day, RSVP by completing the brief information form.